Animals are many-celled organisms that must obtain their food by eating other organisms. In addition most animals reproduce sexually and can move from place to place. Animals need to obtain water, food, and oxygen from their environment, or surroundings. Animals need water because the chemical reactions that keep them alive, take place in water. Food provides animals with raw materials for growth and with energy for their bodies' activities, such as moving and breathing. To release that energy, the body's cells need oxygen. Some animals get oxygen from air; others absorb it from water. An animal also needs to be able to respond to its environment - for example, to find food or to run away from danger. Adaptation is a characteristic that helps an organism survive in its environment or reproduce. Biologists classify animals in the animal kingdom into about 35 phyla, or major groups. Important characteristic used to classify animals is the presence or absence of a backbone. An animal that does not have a backbone is called an invertebrate. Jellyfishes, worms, snails, crabs , spiders, and insects are invertebrates. 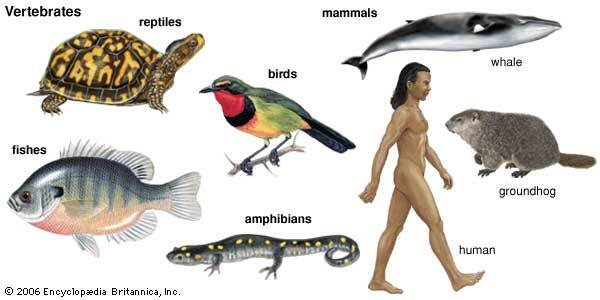 About 95% of animals are invertebrates. A vertebrate is an animal that has a back bone. Fishes amphibians, reptiles, birds, and mammals.